FOX Sports presenter Neroli Meadows is joining TEN’s Before the Game, following the exit of Samantha Lane. She joins Dave Hughes, Mick Molloy, Andrew Maher, Anthony ‘Lehmo’ Lehmann and Ryan ‘Fitzy’ Fitzgerald from this Saturday. However, she will continue her duties with FOX Sports. Meadows has also been a boundary rider for ABC Grandstand. 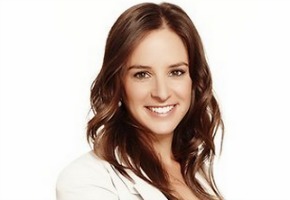 Originally from Western Australia, Neroli began her media career as the weekend sports producer at Perth radio station 6PR in 2006 before a four-year stint with Perth’s number one rating Seven Network as a sports reporter and an AFL producer/reporter on Today Tonight. A keen AFL fan, supporting the Fremantle Dockers, Neroli recounts her most memorable sporting moment as a proud sister watching her big brother make his debut for the Kookaburras along with being in the crowd when the Seattle Seahawks won their first play-off game in two decades while living in the US on a six-month study sojourn at the University of Tennessee in 2005/06. 6:30pm Saturday, March 23 on TEN (Melb, Adel, Perth) and 12:30am Sunday in Sydney and Brisbane. At least she’s not a another Carlton supporter. Hmmm, I don’t know about a dead ringer… it will be interesting how she joins in with the rest of the gang’s repartee. Will she wear her Dockers’ heart on her sleeve? Is it just a coincidence that she is a dead ringer for Sam Lane. Agree Neroli will be a great fit for BTG. Hope it will increase her profile a bit more in the Eastern seaboard. Ang had a baby 8 weeks ago. Neroli knows her stuff, will be a great addition to the panel. Very interesting move by Ten. Is it safe to assume Angela Pippos said no and Ten were forced to look elsewhere?